Based on the comic book series of the same name by Robert Kirkman and published by Image Comics, The Walking Dead stars Andrew Lincoln as Rick James, Sarah Wayne Callies as Lori Grimes; Laurie Holden as Andrea; Steven Yeun as Glenn; Norman Reedus as Daryl Dixon; Jeffrey DeMunn as Dale, Chandler Riggs as Carl; Lauren Cohan as Maggie; Scott Wilson as Hershel; Iron E. Singleton as T-Dog and Melissa McBride as Carol. The series is executive produced by Glen Mazzara, Kirkman, Gale Anne Hurd, and David Alpert with Greg Nicotero as co-executive producer. The series has received widespread critical acclaim since it debuted in 2010 and remains the most watched drama series on basic cable for Adults 18-49 and Adults 25-54 in the USA. The series has garnered an Emmy Award for Outstanding Prosthetic Make-up and a Golden Globe Award nomination for Best Television Series – Drama, among other accolades. Critics have heralded the series as “the most suspenseful show on any network” (Boston Herald) and “the greatest thriller ever produced for television” (Entertainment Weekly). The Walking Dead airs first on FX in the UK and season three will premiere this autumn. 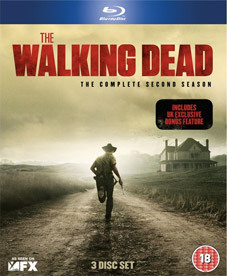 The Walking Dead: The Complete Second Season will be released on UK DVD and Blu-ray on 27th August 2012 by Entertainment One at the RRP of £39.99 for the DVD and £44.99 for the Blu-ray. Let's hope this time that the series will not be cut for UK release as happened with season 1, apparently to obtain a 15 certificate. Season 2 has been rated 18 for home video release, so the signs are good.